One of the best outcomes from learning a lot about a group of species is that I start to see prairie through their eyes. That perspective has been really valuable for me and has led me to evaluate, restore, and manage prairies differently. Over the last couple years, I’ve been learning quite a bit about bees and other pollinators (and dragging you along with me through numerous posts on those species – sorry about that). As a result, when I look at prairies these days, I sometimes feel like I’m doing so through “bee goggles”. Stiff goldenrod (Solidago rigida) is done blooming and well into the process of making seed. It seemed like the blooming window for this and other late summer/early fall species was really short this year. What I’m seeing through my bee goggles these days is that food gets pretty scarce in the fall, and the end of this wildflower season is very near. Even a couple weeks ago, when Anne Stine and I were doing the last field sampling of bees for her research project (September 18 and 20), it was clear that most plant species were done blooming for the season. Most goldenrods were finished, as were sunflowers, tall boneset, and just about everything else. As a result, we didn’t see as many bees as we’d hoped to, and they were very concentrated on the few blooming flowers that were still around. One group of flowers that was still blooming was the asters. In fact, heath aster (Aster ericoides) provided, by far, the greatest abundance of flowers we saw during those September bee surveys. Interestingly, however, even given the scarcity of other flowering plant species, we saw surprisingly few bees using heath aster. We did, however, see lots of hover flies (Syrphid sp) and quite a few wasps. Sure, there were a few bees here and there, including some little sweat bees and a few others, but not all that many. In addition to heath aster, there were two other larger-flowered asters blooming in a few prairies: New England aster (Aster novae-angliae) and panicled aster (Aster lanceolatus). Both of those seemed to host significantly more bee visitors than did heath aster, and New England aster – though pretty uncommon – was the most attractive of the two. Heath aster was in bloom during our last bee sampling period but seemed to be much more attractive to flies and wasps than to bees. Pitcher sage (Salvia azurea) was another late-blooming species that was very attractive, at least to larger bees – as well as butterflies. However, while we saw scads of bumblebees on pitcher sage during our last bee survey period (August 19-20) we only found a couple this time around. Because of that, I assume the queens that will initiate next year’s new colonies have mated and are now finding a nice comfy place to spend the winter. Since producing fertilized queens is the ultimate goal of every bumblebee colony, the rest of the colony members can (and will) die happy, knowing they played their role successfully. Interestingly, while looking for bees, we saw some widely scattered blooming plants of goldenrods, annual sunflowers, tall boneset, and a few others – even though the vast majority of plants within those species had long finished flowering. Some of those plants appeared to have been grazed by cattle or other animals, and so were behind schedule and trying to rush some flowers and seed production before the first freeze. 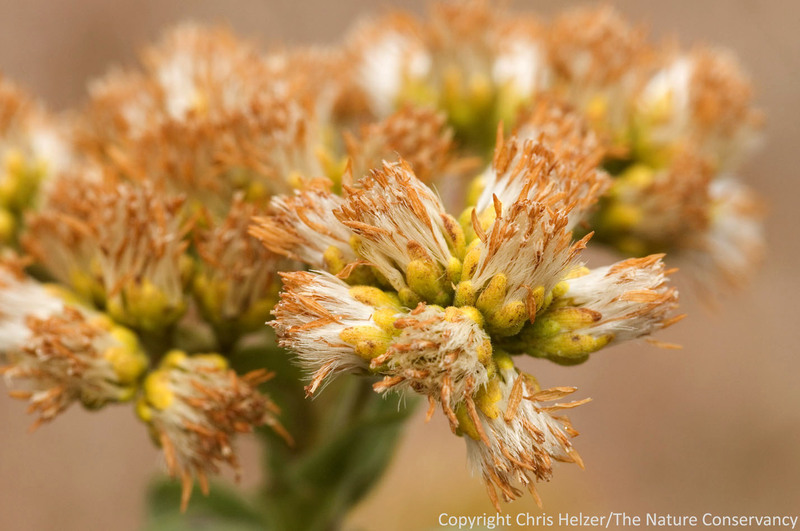 Others just appeared to be late bloomers – in full flower, surrounded by others of the same species that were already decked out in seed heads. Maybe they were just a little different genetically? Regardless, those late individuals were getting abundant attention from bees and other pollinators and were clearly more attractive than heath aster… As long as they are able to get their seeds ripened before temperatures drop too low, those late blooming flowers should come out pretty well. As we harvest seed from some of those species this fall, it would be probably be smart for us to gather seeds from those plants that may be genetically inclined to bloom a little later than their counterparts. Maybe we can create restored prairies with a longer flowering period and give late-season pollinators a little autumn boost. This moth used pitcher sage as an overnight roost, but this particular plant is done providing nectar for the year. There are still a few pitcher sage plants blooming here and there, but not many. I don’t need bee goggles to see that fall has arrived. Our prairies have mostly turned golden brown, and while the range of colors has narrowed, it has been complemented by an incredible array of seed head architecture that lends grasslands a new texture. The subtle beauty of autumn prairies will last until next year’s green up starts, but it will be much quieter for a while without bees and the myriad other insects that make summer sound so alive. 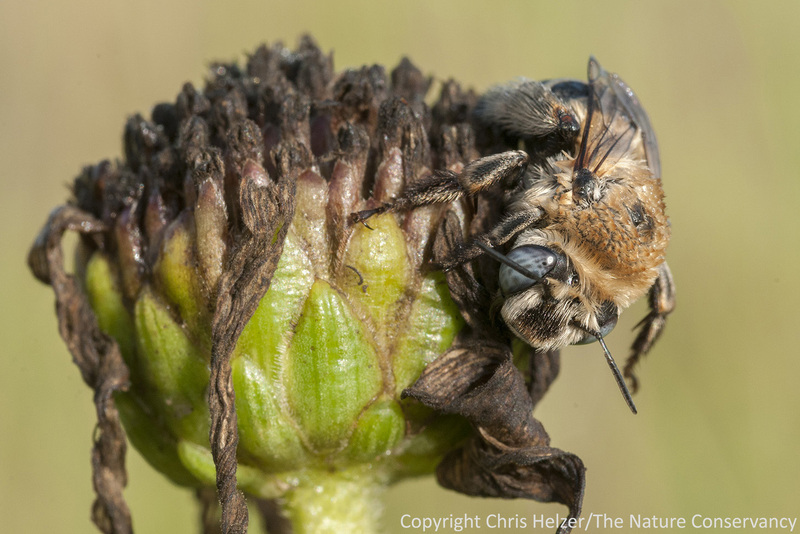 However, as with all prairie animals, bees have their own ways of surviving the coming winter, and will emerge from dormancy – along with the rest of the prairie – when the time is right in the spring. It’ll be good to see them again. This entry was posted in Prairie Animals, Prairie Insects, Prairie Natural History, Prairie Photography, Prairie Plants and tagged bee goggles, bees, fall, foraging, late season, nectar, pollen, scarce, winter by Chris Helzer. Bookmark the permalink. 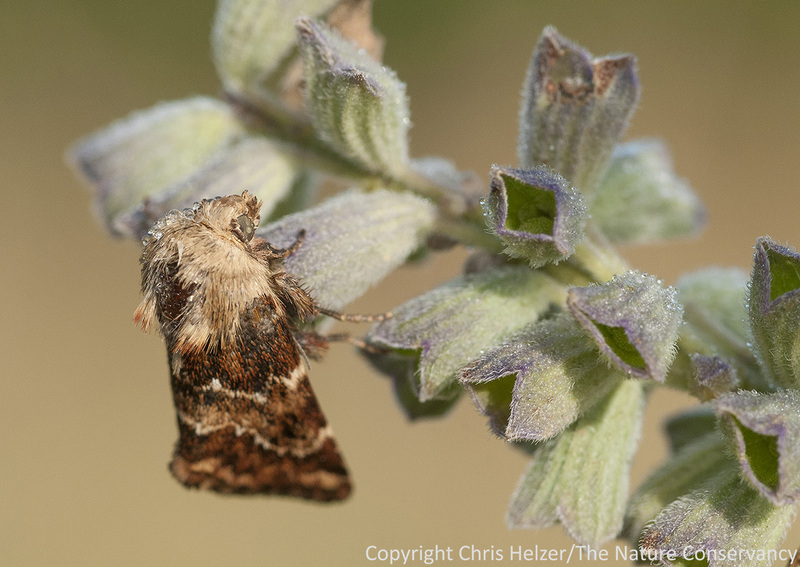 In case you don’t know its identity, the moth on the Pitcher sage is one of the flower-moths, Schinia septentrionalis (Northern flower moth). It reportedly uses Symph. laeve (ok, Aster laevis) as its larval host. Schinia is a very interesting genus because of the intensely close relationship with larval host plants. Robert – thank you. I didn’t know the identity, but I’ll be sure to attach the info to the image now… Interesting about the Aster laevis connection. 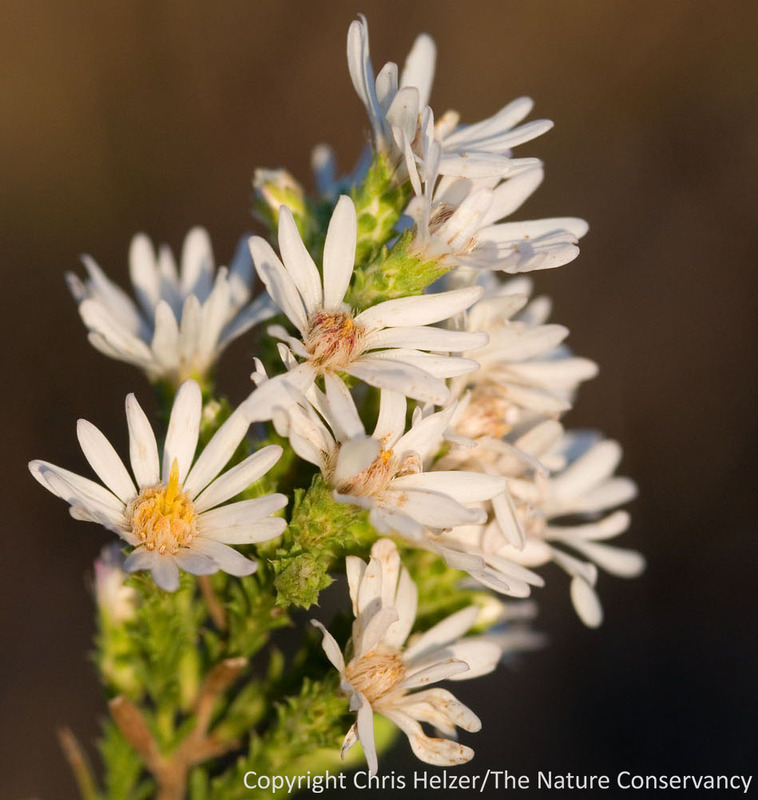 The photo was taken in Aurora, Nebraska, and I don’t know of any Aster laevis populations nearby. I’ll have to dig into that a little. Great to meet you last week in South Dakota! Max. sunflower, Pitcher sage, asters all in bloom now along with Indian grasses and more. Time for you to come down to North Texas and visit TNC Clymer Meadow. Bet Jim Eidson wouldn’t mind a bit! It’d be fun to see Jim on his own turf, so to speak, and to visit Clymer – which I’ve heard a lot about. I love reading your posts Chris. Thanks Jeanine, good to hear from you! I’m glad you’re enjoying them. Chris, Do your bee’s like Gentians and Lady’s-tress Orchids? These are the flowers that come to mind as the last in the Fall. James, we don’t have gentians in the Platte Valley, so that’s out, but we do have the orchids – though they’re pretty widely scattered in restored prairies and sometimes hard to find in the remnants! I assume that digger bees and similar sized bees are using them, but haven’t seen that in person.